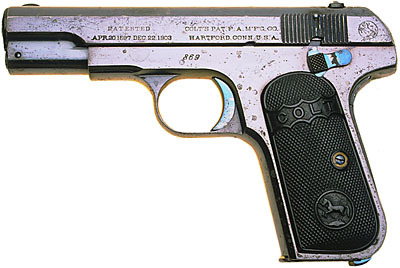 Colt Model 1908 Pocket Hammerless .380 ACP Serial Number 869 Type II (ca 1908) - with separate barrel bushing and 3 3/4" barrel. 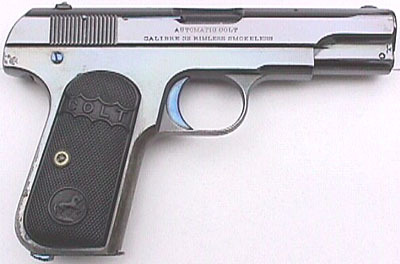 (.380 sn range 1 - 6250) (.32 sn range 72001 - 105000) The .380 Type II is the earliest .type of .380 pistol manufactured. The Type I Model M was only manufactured in .32 caliber. 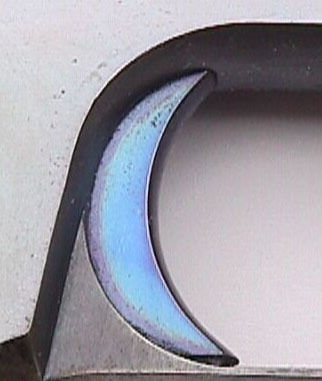 This example has the early high polish blued finish with turquoise or "fire blue" small parts. 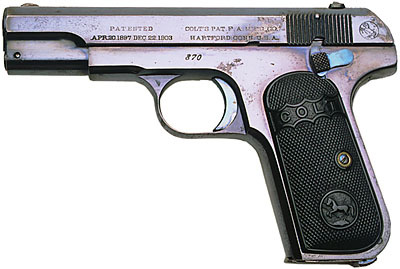 Colt Model 1908 Pocket Hammerless .380 ACP Serial Number 870 Type II (ca 1908) - A consecutive serial number to the above gun, with separate barrel bushing and 3 3/4" barrel. (.380 sn range 1 - 6250) (.32 sn range 72001 - 105000) This example has the early high polish blued finish with turquoise or "fire blue" small parts. 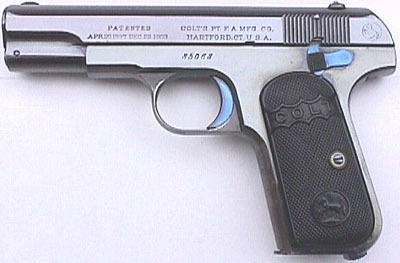 Colt Model 1903 Pocket Hammerless .32 ACP Serial Number 85068 Type II (left side) (ca 1909) - with separate barrel bushing and 3 3/4" barrel. (.32 sn range 72001 - 105000) (.380 sn range 1 - 6250) This example, serial number 85068 (ca. 1909) retains most of its original high polish blue finish. Notice the turquoise or "fire blue" small parts. 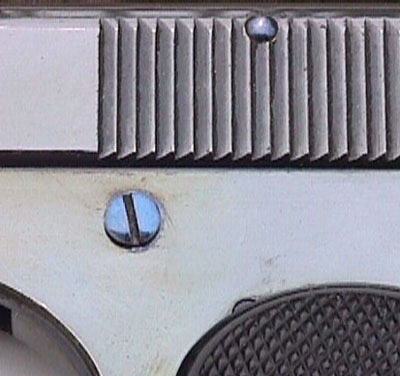 Type I, Type II and the earliest Type III Model M pistols have a high polish thumb safety retaining screw. Type II fire blue extractor. Notice how the visible portion of the barrel through the ejection port is blued. Type II fire blue thumb safety. 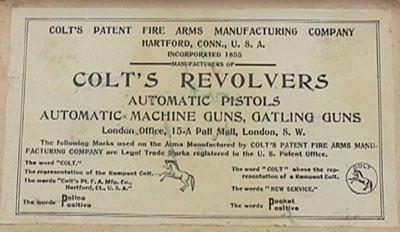 The Rampant Colt on the slide is inside a circle. Close-up of Type II barrel bushing. The bushing is blued, the plug color case hardened and the retaining pin for the plug is fire blued. 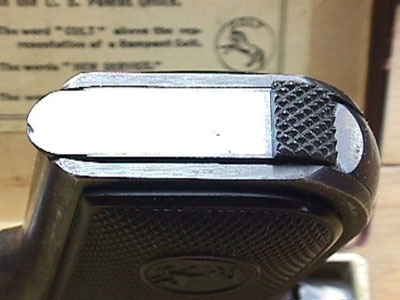 Close-up of grips used on the Type I & Type II Model M .32 pistols. 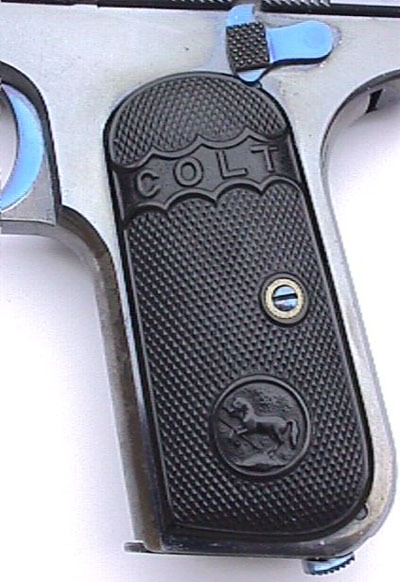 Scalloped lines surrounding "COLT" and early style Rampant Colt in a circle are unique to these early style grips. 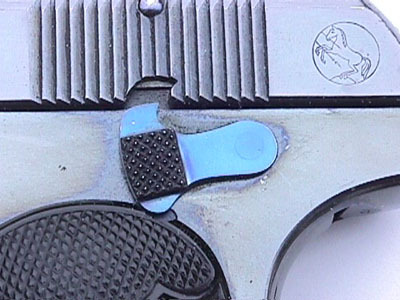 Notice the fire blued trigger, grip screw, thumb safety and magazine release. 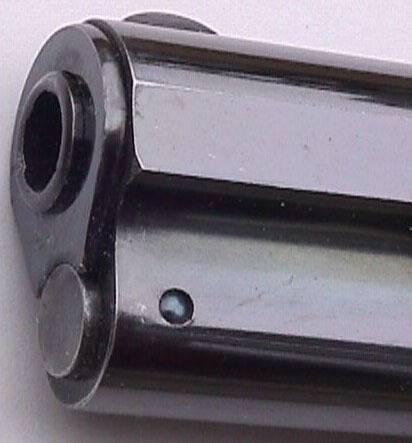 The bottom of the magazine on these early Model M pistols is high polished and unmarked. Also notice the cross-cut serrations on the bottom on the magazine release. The end label on the original box. 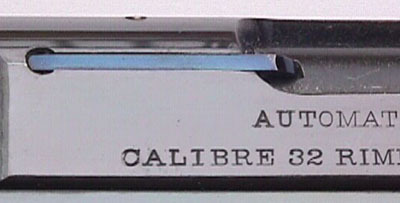 Labels for Type II standard pistols are light blue with black writing. Label located inside the lid of the box.